Uniquely located less than two miles from the southern entrance of Yosemite National Park your cabin is sitting amongst the cedars and legendary sugar pines. You will be close to local amenities such as restaurants and shopping yet private enough to relax after each days adventure within the peaceful tranquility of the forest. Traveling together or with the family - this cabin is like no other. 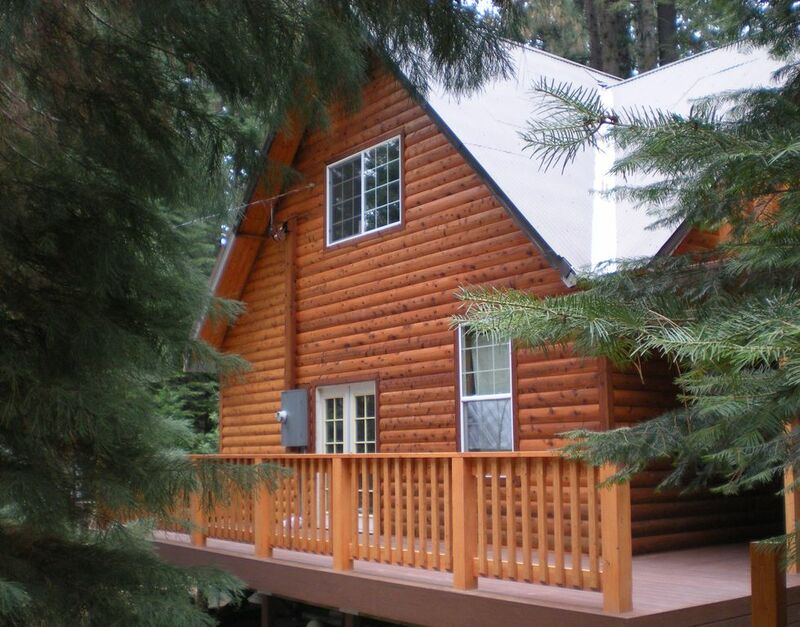 Enjoy your Yosemite experience in a well appointed log cabin in the woods. Newly completed, the cabin provides for the demands of the discerning traveler - gourmet kitchen, large stone fireplace controlled with the touch of a button, authentic claw foot tub that hugs your body, 50 inch flat screen television, high speed wireless, new washer and dryer, four separate decks to enjoy and much more. With over 40 years of local knowledge we would be pleased to assist you in planning those special activities. Find the great restaurant, connect with the perfect guide or simply request directions to that certain unknown swimming hole in the local creek. We are ready to assist. Enjoy the local area recreation: golf, boating, rock climbing, hiking, fly fishing, photography, water skiing, horseback riding, steam train rides, art galleries, etc - all within less than thirty minutes from the cabin. And do not forget - we can prepare the cabin at your request to create that special first impression. We strive to make your dreams come true. Please call at your earliest opportunity so we can begin preparing for your next stay. As residents of the Yosemite area for nearly forty years we have had the unique privilege of experiencing the awesome splendor of Yosemite and its surrounding treasures. Inspired by over a decade of experience in Mobile 5 Star and 4 Diamond properties we are delighted to have personally crafted our own cabin with you in mind. We painstakingly set out to create an authentic Yosemite log cabin experience while properly including the luxuries of a fine county inn. After nearly a decade of dedication we are excited to offer our guests a wonderful cabin in which to create lasting memories and experience Yosemite in the way we have come to love. With forty years of local experience we seek to assist our guests with the knowledge necessary to create that fantastic and memorable vacation. From 'secret' fly fishing spots, areal tours, lessons from a world renowned photographer to selecting the perfect restaurant we are happy to assist in planning your stay. And remember we can set up and stock the cabin so that your stay begins just as you envisioned. Please don't hesitate to ask. Few properties are finely crafted to fit the alpine environment yet appoint the luxuries you expect. Uniquely positioned in Fish Camp (less than two miles from Yosemite) you are within walking distance to shopping, restaurants and spa facilities. Of course in house spa treatments can be arranged. 50 inch HD flat screen television. High speed wireless internet provided. Thousands of recent and vintage movies and classic televisions show provided by Netflix. Good all our fa.family like the stay! Cozy cabin in a quiet neighborhood. Owners are very friendly and accommodating! My wife and I spent our anniversary here, and we loved it! Everything was spotless and elegantly maintained. The perfect combination of luxury and coziness. We will definitely stay here again!